Brain injures can be open — when the scalp and skull are fractured and you can actually see the brain — or closed – when the skull and is intact and you might not even be able to tell that anything went wrong. Brain injuries are generally grouped into three categories — Mild, Moderate, and Severe. The severity rating of the injury is based on the initial injury itself, not the long-term effects. Long-term outcomes from brain injury can actually be worse with mild and moderate injuries, than severe ones. That’s a puzzle that a lot of folks haven’t been able to figure out. 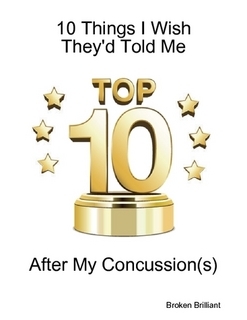 The CDC has a great brochure called “Facts About Concussion and Brain Injury”. Download it here. Hi Betty – that’s perfectly understandable — first, that you’re scared, and second that you’re not talking right. You need to rest and take it easy. Since this is your 14th concussion, your brain is in need of more help, so it can find a balance and retrain itself to do regular things — like talk right. Have you sought help from anyone for this? Are you living in an area where you can see a neuropsychologist or occupational therapist about your issues? Wherever you may be, make sure you get plenty of rest and don’t push yourself too hard. The brain is an amazingly adaptable organ, and when some connections are frayed or broken, others get built up to take their place. Take it easy, take it slow, and treat yourself like a newborn baby — you need sleep and rest, and you also need good nutrition and a regular schedule. The main thing is to not stress out over it. This is the hardest thing, but it’s also the most important. Your brain needs to heal and also relearn some things — and when you are stressed out and anxious, it makes it harder for your brain to learn. Hang in there. Be easy on yourself. Things can get better.